If you own some Wemo device and a Gear S3 Take a look at Tizmo. My Free app on the Galaxy store for Gear S2 and Gear S3. Take a quick look to my video. 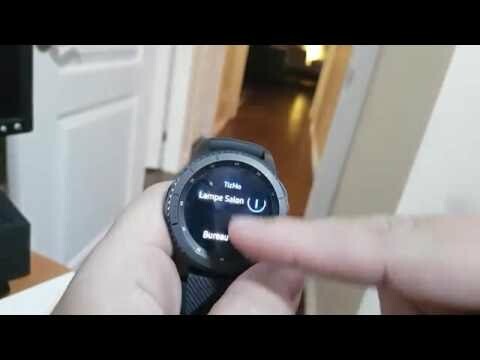 Samsung Gear S3 and Wemo ! That's one cool integration you have there. Can you elaborate on the configuration that you did especially the app for the rest of the community? So I have many wemo ligthswitch and outlet in my house. As my gear S3 was on pre-order couple of week ago. I decided to download Tizen IDE which is the developper SDK for Samsung smart watch. I was thinking of a cool project and came with the idea to develop a custom app to control my Wemo from my Gear S3 Watch. The App is done in C and is now available in the Galaxy App store for free and is called Tizmo which is a combination of Tizen and Wemo ... hehehe not much of imagination there. The app is only available for Gear S3 and S2. The app discover your Wemo device on the wifi network using a UPnP request to populate the list of the device automaticaly. Once the device are listed the App send the correct command to any of the lightwitch or outlet to control them. Currently the app support on/off and there is also a All on all off. The app is currently pretty basic but I can't live without it. It's a dream for the lazy guy that want to turn on and off any light while going to bed or while watching tv on the couch. I plan to add other cool feature on the app such as custom scene. As you see on the video the app is pretty responsive. Like I said if some of you guys have Gear S2 or S3 the app is there for free for you to enjoy your wemo as much as I do. Hi Any chance you can implement the Wemo link too to control the light bulbs, I have a Gear S3 and using your app I can see the Wemo Link, but obviosuly nothing happens with it, or happy to collobarate if you need some testing doing? As I do not own any Wemo Link it will be hard for me to figure out it report all the devices that are connected to this devices. I'm about to buy some wemo dimmer to integrated them in the application. Adding the Wemo Link to it would have been nices to maybe we could have some chat together and try and test some hack to determine how to access it.